The decision to outsource your company’s EDI to a managed B2Bi services provider can be a long process. In some cases, it can also become stressful. Some companies will offer you the world, without the ability to deliver it to you. 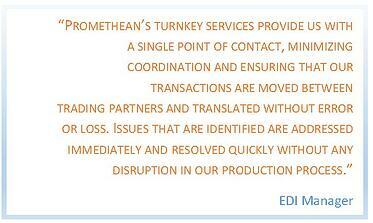 Promethean is a customer-centric organization and we have found success in acting proactively to anticipate our customers’ wants and needs. In the EDI world, certain issues may arise that require immediate attention. Don’t you want to be able to call or email your managed B2Bi services provider and instantly get a response from your personal customer support person? That is the norm when working with Promethean. We understand the urgency of EDI issues and have the experience to settle them promptly. You get a dedicated staff, available 24/7, to provide you with the answers you need, right when you need them. 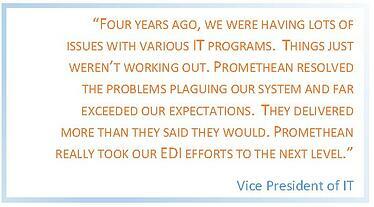 When partnering with Promethean you receive a complete EDI department specializing in data transformation, resulting in fast and thorough solutions. We know EDI inside and out! Promethean is what you are looking for in a managed B2Bi services provider: fast, knowledgeable, proactive, and available at all times. No more missed opportunities, chargebacks from vendors due to slow response time or delays in project timelines. Download our case study to discover how our managed B2Bi Services solutions helped an OEM and After-Market Tire Distributor as they grew into a billion dollar company.